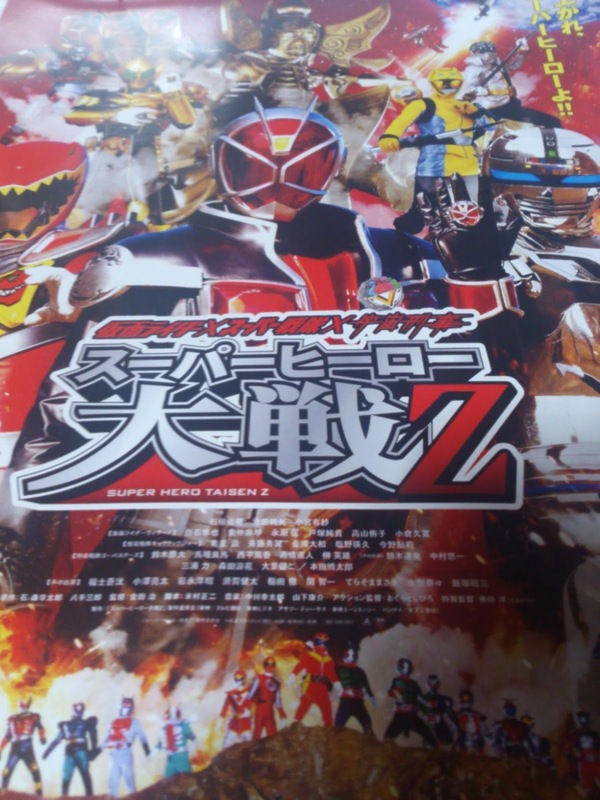 Super Hero Taisen Z Coming Next Year! 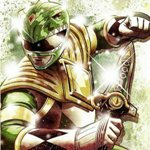 Henshin Justice have posted a very awesome news! Coming from a reliable person, it has been confirmed that coming our way next year will be “Super Hero Taisen Z” (スーパーヒーロー大戦Ｚ)! Classic Ishinomori heroes are expected to make their appearances! This year's dream crossover movie “Kamen Rider × Super Sentai: Super Hero Taisen” manages to debut at the top of Japan Box Office, 41,0038,450 yen from 355,985 audiences at 292 screens during the weekend. Sadly, the film left many disappointed fans due to having no plot and poor execution of the story. A teaser for next year's “Kamen Rider × Super Sentai: Super Hero Taisen Z” (仮面ライダー×スーパー戦隊 スーパーヒーロー大戦Z) played after the screening of “Kamen Rider Movie War ULTIMATUM”, which shows a little preview on what fans could expect in the film. 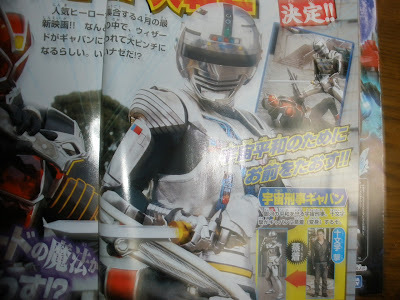 According to Igadevil, Space Sheriff Gavan typeG will be in the film, so as the Space Ironmen Kyodain from the recent Kamen Rider Fourze summer film. The teaser used existing footage, but featured Gavan typeG saying, “I can't forgive Gavan!”, and a line of text suggesting there's an emphasis on space heroes. It has been confirmed via Twitter that Shinichiro Shirakura will be the producer of next year's “Super Hero Taisen Z” (スーパーヒーロー大戦Z). He also reveals that the title is temporary only. Shinichiro Shirakura was also one of the producers in this year's “Super Hero Taisen”. Included in the shows he worked on as a producer are Kamen Riders Hibiki, Den-O and Decade, Zyuranger, Dairanger, and Jetman, to name a few. Moreover, he added that the new film will not be a continuation of the first one, hinting that it would feature a brand new story. The new film's teaser premiered after the screening of “Kamen Rider Movie War ULTIMATUM”, featuring Space Sheriff Gavan typeG and the Space Ironmen Kyodain. Metal Heroes Join “Super Hero Taisen 2”?! Earlier this month, it has been revealed that Space Sheriff Gavan typeG will be playing a big part in the upcoming 2013 crossover film, tentatively entitled “Super Hero Taisen 2” (スーパーヒーロー大戦2). Now there have been information that more Metal Heroes are expected to take part in this huge war! So far, there's no word yet on who are these Metal Heroes. Aside from Gavan typeG saying, “I can't forgive Gavan!”, the Space Ironmen Kyodain from the recent Kamen Rider Fourze summer film is also confirmed to appear. This year's dream crossover movie “Kamen Rider × Super Sentai: Super Hero Taisen” manages to debut at the top of Japan Box Office, earning a total of $18,973,831 at 292 screens during the weekend. Sadly, the film left many disappointed fans due to having no plot and poor execution of the story. It has been confirmed! 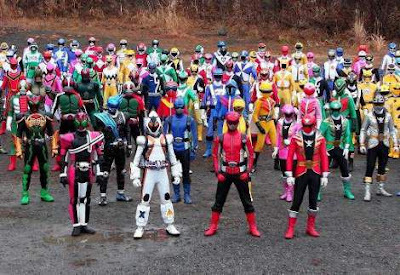 This year's crossover film will be entitled “Kamen Rider × Super Sentai × Space Sheriff: Super Hero Taisen Z” (仮面ﾗｲﾀﾞｰ×ｽｰﾊﾟｰ戦隊×宇宙刑事　スーパーヒーロー大戦Ｚ). A post from Ibaraki Film Commission revealed it, when looking for extras for the film. The filming will happen on January 20th. The first shoot is said to be "a natural disaster scene set in the city". We might get additional information (or rumors) after that, from those who have attended the filming. It has been announced after the “Movie War ULTIMATUM” film that a new “Super Hero Taisen” is in production. Notable from the preview is Gavan typeG saying, “I can't forgive Gavan!”, the Space Ironmen Kyodain from the recent Kamen Rider Fourze summer film is also confirmed to appear. Produced by Shinichiro Shirakura, “Kamen Rider × Super Sentai × Space Sheriff: Super Hero Taisen Z” premieres this Spring. It has been revealed that this year's crossover film, “Kamen Rider × Super Sentai × Space Sheriff: Super Hero Taisen Z” will be directed by no other than Osamu Kaneda. Kaneda also directed the first Super Hero Taisen film. Also included in Kaneda's film direction portfolio are “Space Sheriff Gavan THE MOVIE”, “Let's Go KAMEN RIDERS”, and “Chou Den-O Trilogy Episode Red”. He also worked in Tokumei Sentai Go-Busters, Kamen Rider OOO, Decade and Den-O. Additionally, it is reported that the villains this time will be called Space Shocker. No other information had been revealed as of writing. The latest issue of a Japanese magazine teases what's in store for us in this year's crossover film, “Kamen Rider × Super Sentai × Space Sheriff: Super Hero Taisen Z”. Above is the blown-up part of the magazine page. The magazine shows Space Sheriff Gavan typeG along with Kamen Rider Wizard and KyoryuRed of the Zyuden Sentai Kyoryuger. 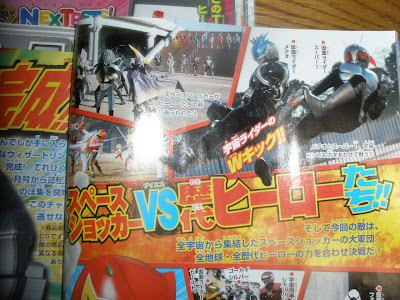 Super Hero Taisen Z: Super-1, Gavan VS Wizard?! 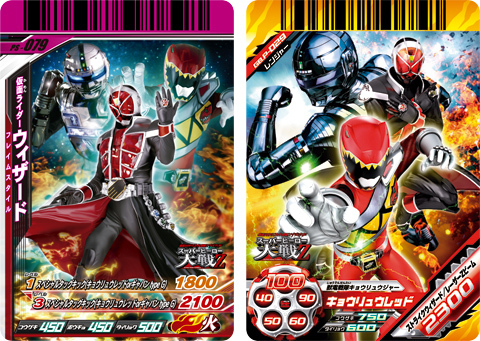 The first scans for the upcoming Kamen Rider x Super Sentai x Space Sheriffs: Super Hero Taisen Z has surfaced online and it features the first space Rider, Kamen Rider Super-1 and... Wizard vs. Gavan?! 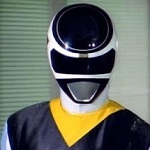 The new Gavan appears in the movie as he claims that in order to protect the peace of outer space, he needs to defeat Wizard. But why!? 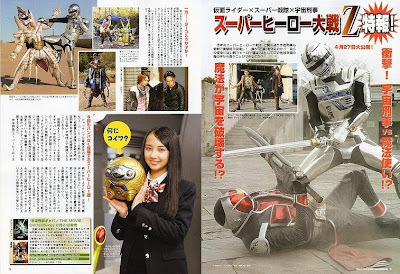 Yuma Ishigaki will return as Geki Jumonji, who can transform into Space Sheriff Gavan. Our heroes will fight the evil Space Shocker with monsters from all over the universe. Earth's heroes have to gather their strength and defeat the evil villains. 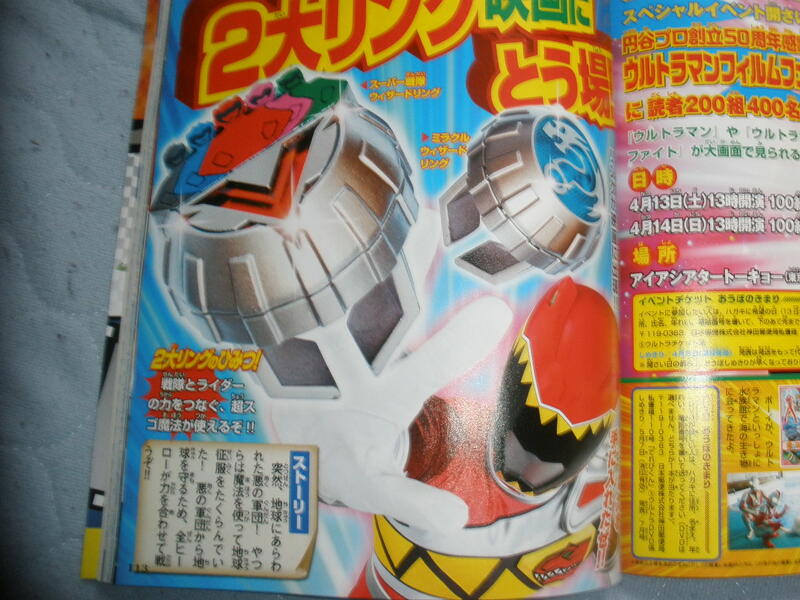 Kamen Rider Super-1 will fight alongside Kamen Rider Meteor to perform a Space Rider Double Kick! Beast VS Sharivan, why would heroes of justice be fighting each other!? The new team, Kyoryuger will also be in this movie. Ikadevil, from the original Kamen Rider, will be receiving a new remade suit and will be known as Space Ikadevil in this movie. 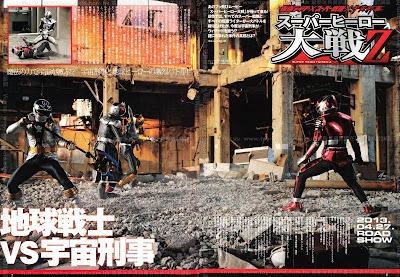 A new image for this year's crossover film, “Kamen Rider × Super Sentai × Space Sheriff: Super Hero Taisen Z” was revealed, featuring Gavan -typeG- against two of the members of the new villain, Space Shocker. These monsters are Space Ikadevil, and Space Spiderman. They are "space versions" of the kaijins from the original Kamen Rider series. Yoko / Yellow Buster is also seen in one part of the image. Directed by Osamu Kaneda, and Produced by Shinichiro Shirakura, “Kamen Rider × Super Sentai × Space Sheriff: Super Hero Taisen Z” premieres this Spring. TOEI had recently revealed the staff and initial cast list for this year's crossover film, “Kamen Rider × Super Sentai × Space Sheriff: Super Hero Taisen Z”. The film is scheduled to premiere this April 27th. Calling themselves Space Shocker, the evil organization returns with the power of magic, claiming that they want to destroy the universe. Kamen Rider Wizard, Space Sheriff Gavan, Tokumei Sentai Go-Busters and eventually Zyuden Sentai Kyoryuger join the fight against the evil organization. All your favorite heroes will be back, turning despair into hope, in an all new, and never seen before hero epic! Directed by Osamu Kaneda (kamen Rider Fourze) with screenplay by Shoji Yonemura (KR Kanuto, Smile! Precure) , and produced by Shinichiro Shirakura, “Kamen Rider × Super Sentai × Space Sheriff: Super Hero Taisen Z” premieres this April 27th. Hm mal eben die Darth Vader Melodie aus Star Wars geklaut. Official pages for Horipro talents Suzuka Morita and Kenta Suga have been updated, adding this year's crossover film, “Kamen Rider × Super Sentai × Space Sheriff: Super Hero Taisen Z”, as their latest project. Suzuka Morita previously played Kotoha Hanaori/ShinkenYellow in Samurai Sentai Shinkenger and Shelly in Space Sheriff Gavan The Movie, but the site doesn't state which role she will play in the film. Meanwhile Kenta Suga played Saburo Kazeta/Sannagiman/Inazuman in the recent Kamen Rider crossover film, “Kamen Rider Movie War Ultimatum”. 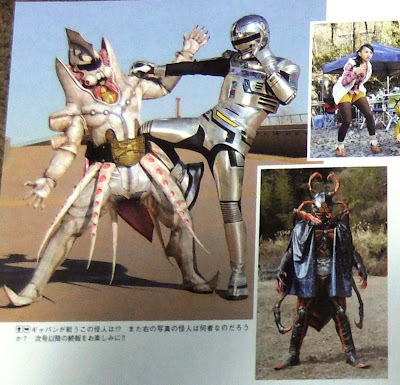 More details about the villains of Kamen Rider x Super Sentai x Space Sheriffs: Super Hero Taisen Z surfaced online thanks to clearer scans! In addition, we also have new info about the heroes! The movie features the evil organization known as Space Shocker led by Space SpiderMan. He is the evolved version of the original SpiderMan from the original 1971 Kamen Rider series. Aside from Space Ikadevil, also part of the organization is the Pteranodon Yummy from Kamen Rider OOO. In the side of our heroes, Special Police Dekaranger, Choushinsei Flashman, Kamen Rider Meteor, Kamen Rider Fourze, Kamen Rider Decade and Kamen Rider Super-1 will only appear in suit, with voice actors saying their lines. Yoko Usami aka Yellow Buster is the only member of the Go-Busters that will appear out of suit. She is seen holding Beet Buster's Micro Buddyroid named Chisato. Super Hero Taisen Z premieres this April 27th. Katsuhiro Suzuki's official website announced that he is part of the cast of Kamen Rider x Super Sentai x Space Sheriffs: Super Hero Taisen Z! He will reprise his role as Hiromu Sakurada aka Red Buster of Tokumei Sentai Go-Busters. In the movie, Yoko is waiting for Hiromu and Ryuji for their planned camping trip when a mysterious robot named Psychoron fell from the sky. Additional information from the Kamen Rider Winter Magazine was revealed for this year's crossover film, “Kamen Rider × Super Sentai × Space Sheriff: Super Hero Taisen Z”. In the film, Space Sheriff Gavan was tasked to execute two wizards, thus attacking Kamen Rider Wizard and Beast! The Tokumei Sentai Go-Busters decided on going to a camping trip. But Hiromu and Ryuji both canceled the plan, leaving Yoko alone in the forest, waiting. All of a sudden, a mysterious golden robot falls down from the sky. Called Saikoron, the Space Shocker, led by Space IkaDevil and Space SpiderMan, is trying to get their hands on it. But for what reason? As reported in the past, Kenta Suga, who played Saburo Kazeta/Sannagiman/Inazuman in the recent Kamen Rider crossover film, “Kamen Rider Movie War Ultimatum”, will be in the film. In “Super Hero Taisen Z”, due to unknown reasons, he appeared before Gentaro, calling him his teacher. The present Gentaro, who is still a student, has no idea what’s going on. Directed by Osamu Kaneda (kamen Rider Fourze) with screenplay by Shoji Yonemura (KR Kabuto, Smile! Precure) , and produced by Shinichiro Shirakura, “Kamen Rider × Super Sentai × Space Sheriff: Super Hero Taisen Z” premieres this April 27th. ich sags von vornherein das später raus kommt das alles nur ein Missverständnis ist und Wizard/Beast gar nich gemeint sind. 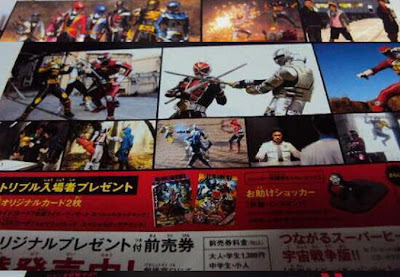 An advertising pamphlet reveals a more detailed plot for this year's crossover film, “Kamen Rider × Super Sentai × Space Sheriff: Super Hero Taisen Z”. As revealed in earlier information, they will fight the Space Shocker who uses magic, and the Space Sheriffs thought that Kamen Rider Wizard is their leader! Calling themselves Space Shocker, the evil organization returns with the power of magic to cause a certain phenomenon, and attacks Earth. 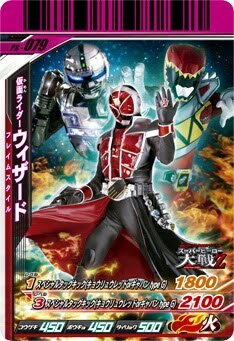 Thinking that Kamen Rider Wizard is their leader, the Galactic Union Police sends Geki Jumonji/Space Sheriff Gavan to arrest Haruto. 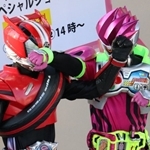 Haruto and Geki later forms a bond, after realizing that Wizard might not be evil after all. Soon they find out that Space Shocker, led by Space IkaDevil, is behind this. Geki pursuits after Space Shocker, but appearing before him the Space Mafia Mado, Space Sheriff Sharivan's archenemy whom he previously defeated. Meanwhile, while on a camping trip, Yoko, after being left behind by Hiromu and Ryuuji, end up finding a mysterious golden robot called Saikoron, who seems to hold a secret. With Earth on the verge of getting destroyed by the magic phenomenon caused by Space Shocker, the Galactic Union Police decides to use the Super Dimensional Cannon to destroy Space Shocker and the Space Mafia Mado! Will they succeed? Additional cast list for this year's crossover film, “Kamen Rider × Super Sentai × Space Sheriff: Super Hero Taisen Z” had been confirmed, which includes supporting characters from Kamen Rider Wizard, Kyoryuger, Go-Busters, and the Space Sheriff Gavan THE MOVIE. Die 2 Karten sehen sehr cool aus. A new image for this year's crossover film, “Kamen Rider × Super Sentai × Space Sheriff: Super Hero Taisen Z” confirms the appearance of some Metal Heroes, taking part on the war. Six more Metal Heroes join the three Space Sheriffs to regain their shining glory! Appearing in the film are Janperson, Jiraiya, Jiban, DraftRedder (from Exceedraft), BlueBeet (from Juukou B-Fighter), and Kabuto (from B-Fighter Kabuto). No additional information had been revealed at this point. 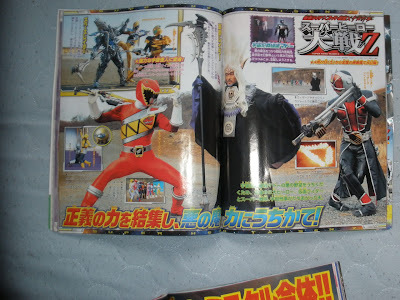 Also seen fighting with KyoryuRed and Kamen Rider Wizard is the Strategist Reider, who will try to resurrect Kyodain. The character originally appeared at the 2nd half of Space Sheriff Sharivan, intending to kill the titular character through Psychological Warfare. The above image shows Kamen Riders Hibiki, Amazon and Beast, with Liveman and Gingaman fighting against the Space Shocker's kaijins and combatants. Also seen in the small boxes are match-ups between Gavan and Kamen Rider Wizard; the Space Ironmen siblings against Gavan; and, Kamen Rider Fourze and Inazuman's team-up. Freue mich schon richtig auf dem Film. Nur schade das mein Lieblings Rider Decade als Schauspieler nicht wieder dabei ist. The latest issue of Figure-Oh Magazine reveals new scenes from the this year's crossover film, “Kamen Rider × Super Sentai × Space Sheriff: Super Hero Taisen Z”. A large spread shows us the battle between the Wizards (and GokaiSilver) against Space Sheriff Sharivan. 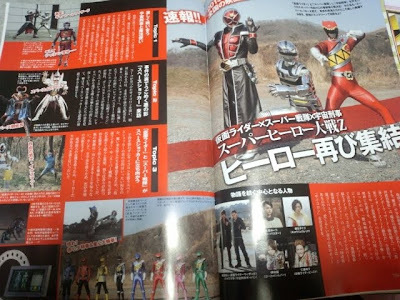 Another scan shows some members of the Space Shocker lead by Space Spiderman, Gai as he disguises himself as a Shocker combatant, Yoko and Usada finding Psychoron, Retsu Ichijouji's new job, and the team up between Kamen Rider Decade, Fourze and Meteor, Super-1, Gavan, the Dekarangers and Flashman! 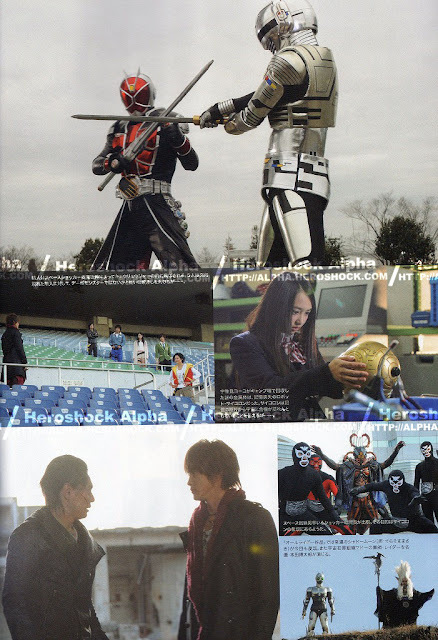 New scans for this year's crossover film, “Kamen Rider × Super Sentai × Space Sheriff: Super Hero Taisen Z” show additional scenes in the film including the meeting of Kamen Rider Wizard and the Kyoryugers. 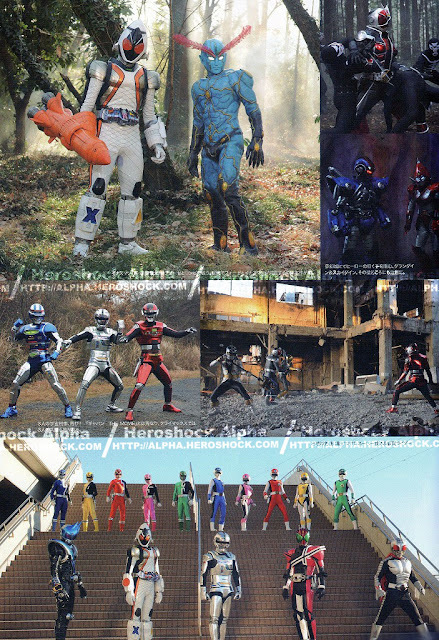 A clearer version of the scan featuring Gavan, Kamen Riders Decade, Fourze, Meteor, and Super-1, lining up with the Space Police Dekarangers and Flashman, is seen above. Calling themselves Space Shocker, they returned with the power of magic, and plans to destroy the universe! Kamen Rider Wizard, Space Sheriff Gavan, Tokumei Sentai Go-Busters and eventually Zyuden Sentai Kyoryuger join the fight against the evil organization. All your favorite heroes will be back, turning despair into hope, in an all new, and never seen before hero epic! 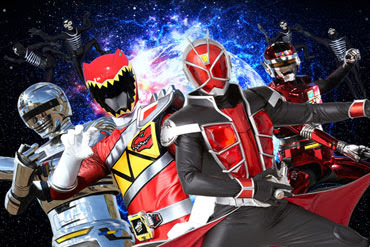 “Kamen Rider × Super Sentai × Space Sheriff: Super Hero Taisen Z” premieres this April 27th. Just like last year, this year's Super Hero Taisen will have it's own set of net movies! Called "Net Movies Kamen Rider x Super Sentai x Space Sheriffs: Super Hero Taisen Otsu", this series of shorts will be released online starting this April 14! Aside from that, it is also confirmed that Ryuji Sainei will reprise his role as DekaRed in the net movies. SHTZ: Kyoryuzin & WizarDragon Combines! New images of Kamen Rider x Super Sentai x Space Sheriffs: Super Hero Taisen Z has surfaced online! The new images features KyoryuGold and a special Kyoryuzin combination! 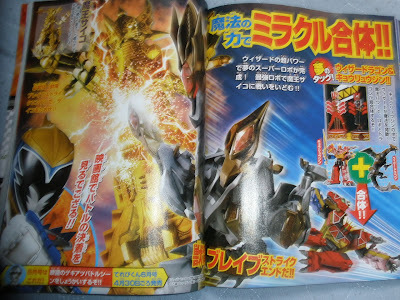 In the movie, Kyoryuzin and WizarDragon will combine! With this combination, Kyoryuzin has the ability to perform a special kind of kick, which they used to defeat King Psycho! KyoryuGold will also appear in Super Hero Taisen Z as he will team-up with Kamen Rider Beast. In addition to that, Kyoryuzin and WizarDragon will combine, giving Kyoryuzin a special kind of kick that they will use to defeat King Psycho! 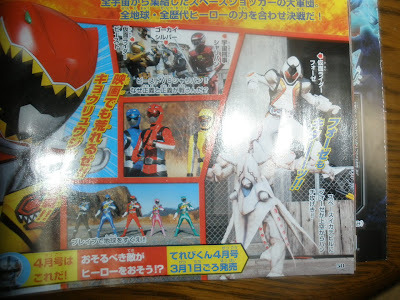 Aside from the spread above, which features KyoryuRed and Wizard vs. Reider, the smaller images on the side features KyoryuGold teaming up with Beast, Yellow Buster vs. 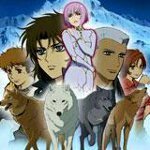 Shadow Moon and the line-up of animal-themed heroes! Produced by Shinichiro Shirakura (Super Hero Taisen), this movie is directed by Osamu Kaneda (OOO - Den-O - All Riders: Let's Go KAMEN RIDERS) and written by Shoji Yonemura (Kamen Rider Kabuto). Super Hero Taisen Z will premiere on April 27, 2013.